Now, this is in rural Haiti, but the recipe is the same in Kafou and inner city. meal preparation is a big deal, no matter how you slice it. Kloteed does this outside the kizin, the outside cook house with a wood fire, while her sister Nadia tends the fire and the coffee. More about the coffee next blog. That's an istwa all by itself. I am legend. Klo squats by the mache ak pilon, with some vegetables in a plastic tub and a knife not the size of a machete, but almost. She hiked up to Kampon this morning for vegetables and is proud of her findings, her purchases. With a knife held with the delicacy of chopsticks, she’s slicing away rapid fire while I wait for a thumb or finger tip to land with the slices of carrots. Then, the spices to be mashed in the pilon: garlic and something I think is anise. Then, aronswaI a kind of yucky dried fish, appears wrapped in a bit of paper. Looks like it is headed to be mashed in the pilon as well. I cannot stand aronswa! Do I say so, and spoil the recipe? An onion whirs in her hand. Slices plop into the plastic bin with the carrots. She sidles over to the cookhouse and stirs the coals, blows. A huge chodye is set on top, and some precious cooking oil is poured in. Then the epis (spices). If you think all this is a big deal for one meal, one ordinary well, I agree. 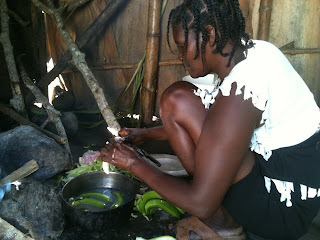 I am not sure there is any sort of “simple” plain cooking in rural Haiti. Certainly no “fast food.” And all foodstuffs need to be cooked: There’s no ready mix this or that, not even any bread, for God’s sake. If she has made some, there might be mamba (peanut butter) for purchase at Madame Mira’s or further down from our mountain, at Madam Moise. One summer, I got a whole jar full of the stuff and spread it on biskwi, even stale biskwi, when there was nothing else to eat. Which was usually the case. 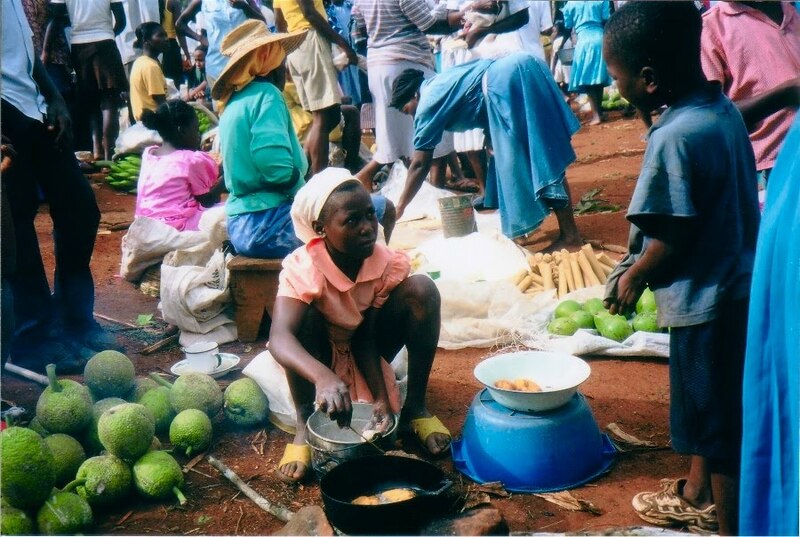 Cooked food, the cooking of food, is a big deal when you are using a machete and an axe, getting and chopping wood, and slicing vegetables in your bare hands. Kloteed is cooking. I am in awe. Neighbor kids are lucky - Celiane, oldest of 10, found some corn in the jaden, she will roast it and they will have mayi boukane this morning, while they wait for the main meal. 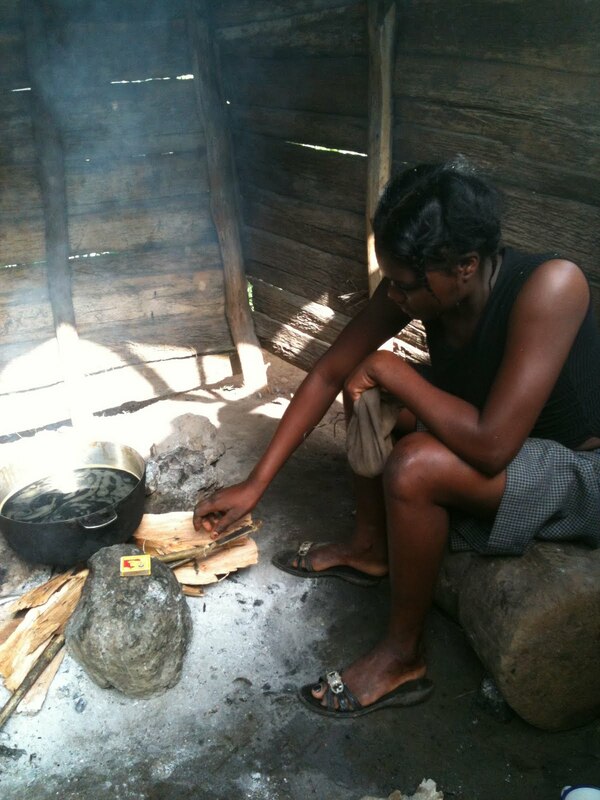 Madame Sove, in another kizin, peels banane, plantain, which will be boiled. Sometimes, they have rice. Mostly, not.